Unlike in previous generations, kids are growing up with the Internet as part of their lives How the Internet of Things Is Dangerous For Your Kids How the Internet of Things Is Dangerous For Your Kids Mixing kids and technology can be a scary thing. Do you know all of the ways the Internet of Things (IoT) could hurt your children? Read More . As a parent 7 Ways Your Children Might Bypass Parental Control Software 7 Ways Your Children Might Bypass Parental Control Software Just because you've installed a safety net in parental control software doesn't mean your children won't find a way to navigate through it. Here's how they'll do it! Read More , this opens up a whole new world of challenges. When should you let your kids use the Internet for the first time? At what age is it appropriate for them to hop on? What should you tell them before they do. 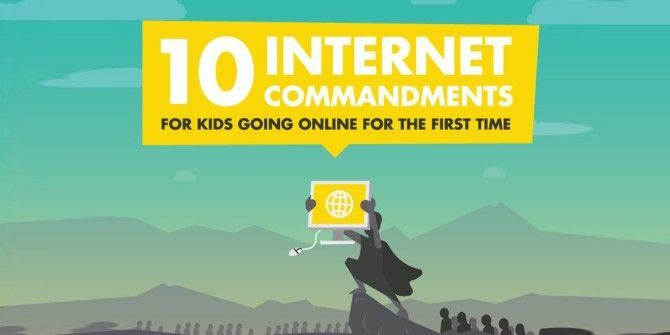 The infographic below feature 10 critical things all parents should teach their kids about the Internet before their first time online. Will they guarantee that they’re safe and that they don’t do anything dumb? No, but they’ll give them a great start. Should 5 & 6 have the same bullet points?